A St. Scholastica graduate who now speaks nationwide about his personal struggle with depression will return to campus later this month to speak to students. 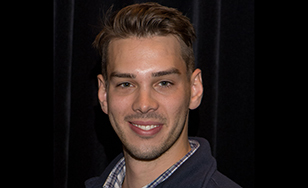 St. Scholastica's chapter of Active Minds, a nonprofit mental health advocacy group, will host 2014 social work graduate David Romano at 7 p.m. Thursday, Oct. 19 in the Mitchell Auditorium on campus. His presentation, "It Wasn't Supposed to Happen to Me," is free and open to the public. Romano, who grew up in Hermantown, has made it his life's mission to reduce the stigma surrounding mental illness. After being diagnosed with depression in high school, he struggled with the stigma that often surrounds mental health problems. Because of his own experiences, he became committed to helping others - particularly men - realize that it's OK to seek help. He has become a well-known mental health advocate, even traveling across the country by bike in 2015 and giving presentations along the way through Active Minds. "I really want my audiences to start that conversation on mental health; open up that dialogue," Romano said. "That's the only way that the stigma surrounding mental health can be destroyed, and we can start to be happy with ourselves and proud of who we are."